The Tories’ latest wheeze to head the racists in blazers off at the pass is this: to make Johnny or Joanna Foreigner have to pay for his or her treatment on the NHS, unless it’s an A&E visit. Well, it’s not that new, but it’s back in the papers, and it sounds like Mr Hunt has spent another ten minutes thinking how it’d work. Time for a crass press release! As the Guardian points out, the cost of the problem they’re trying to solve is £33m out of £109,000m – less than a thirtieth of one percent of the English NHS budget. Actually, is it even right to call the English system “the NHS” any more? It feels like spin, or perhaps nostalgia: like the sad wee British Rail logo you still get on your tickets even through the system has been smashed into pseudo-competing franchises to be run by anyone’s national rail company except our own. But I digress. This may be a gross over-simplification, but imagine NHS services as a line that stretches from the poor souls stretchered into A&E after a motorway pile-up at one end through to the most elective of treatments at the other. If the Tories erect a wall just beyond A&E, they ensure non-British nationals go untreated for infectious diseases they currently can see a GP for. Sure, if Johnny in this case is Mohammed Al-Fayed they’ll go to Harley Street or BUPA. But most foreign residents are working, studying, looking for work. And deciding not to treat those people when they’re sick means they’ll spread disease to others, leading to more unhappiness and taking folk away from their jobs. And costing the NHS more. They may get sicker and sicker until they do eventually get rolled into A&E: now they’re much more difficult to treat. Again, costing the NHS more. This stupid idea isn’t even likely to save taxpayers money. In fact, immigrants are taxpayers too: VAT in every case, often income tax, stamp duty or VED, all sorts. Part of the reason the NHS has been so totemic for voters is that it treats everyone. It’s one of the few bits of actual socialism to have put down proper roots across much of the political spectrum. But the Orange Book Lib Dems and the ideological and racist austerity-addicts of the modern Tory party want to undermine that universality. The mid-market press and Nigel Farage have laid the groundwork for them to start this assault by not treating foreigners. How long before “shirkers” get treated after “strivers”? Not long, perhaps. There’s already a campaign going on the right (with all sorts of misleading and emotive propaganda in it) to start charging for GP visits. It’s to reduce pressure on them, honest! Nonsense. It’s to ration healthcare away from the poor. Would the worried well middle classes be put off by a fiver charge? Unlikely. Would the seriously ill poor be deterred? Sometimes. And so the pressure on GP’s surgeries would fall, perhaps, but offset again by extra pressure on A&E. And at the price of a fair system that treats people according to need, not income. Thank goodness this vicious and counterproductive idea would only apply to the English health service, although I’m starting to have the first twinges of anxiety when I visit England: what will happen if I get ill? A taste of the same concern people get when they visit America: will my travel insurance cover me? Will I come back a million in debt for having broken my leg? It baffles me that English voters appear to be swallowing this stuff: competition in the NHS, patchworks of privatised services, bureaucratic chaos. Shouldn’t this lead to protests and a collapse in the polls? Perhaps it’s because Labour aren’t opposing it with the kind of fierce clarity that led their much more admirable predecessors to set the NHS up in the first place. In fact, they were making the same sort of argument before they got chucked out in 2010. Health is one of those areas where the SNP have got it broadly right, for my money, and one where devolution is saving Scotland from horrors no-one foresaw during the 1997 referendum campaign. Westminster may have a sickness at its heart, but whenever English voters turn against market control of health, hopefully Scotland will have a system that they can point to and say – that! That’s what we want back! This entry was posted on June 30, 2013, 12:05 pm and is filed under Health, Holyrood, Westminster. You can follow any responses to this entry through RSS 2.0. Both comments and pings are currently closed. If you’re having ‘twinges of anxiety’ as to the English NHS, may I suggest putting down the Guardian and getting out a bit more? Equally I suspect that’s hardly the case when certain patients look longingly at England, which is providing more comprehensive treatments in several areas than are available in Scotland. Yes, I’m inclined to think charging for appointments is a bad idea, which is why it almost certainly won’t happen. This suggestion, however, that using some private elements means the NHS disappears is silly. The NHS has always been a hybrid: most notably GPs are private sector contractors. In NHS Scotland, treatments have always been contracted out to the private sector where there is a pressing need for it: but the administrative burdens remain high. 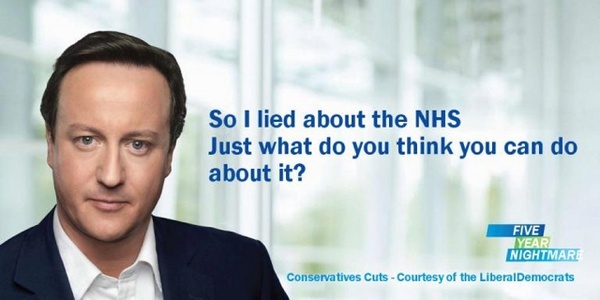 If you’ve got an ideological commitment to an expressly socialist NHS, I wouldn’t expect people to share it. Most people want to know they’ll receive good treatment even if they can’t afford it – beyond that, they’re happy with what is effective. NHS England has to do more with less than in Scotland: we should see their reforms as a golden opportunity to observe and adopt changes that work up here. It is suspicious really. I know friends of mine down south feel that there is some kind of conspiracy to conceal what is going on up to and including the BBC. I think that kind of thing is a bit bonkers but I can see how they have got there. Just to take one example – most of us will have seen the list of MPs & Lords who have financial interests in private healthcare companies yet who still vote on legislation which increases opportunities for those companies. How is that even allowed? Surely they should declare an interest and not vote. I don’t understand the Johnny Foreigner proposal. If we are talking EU/EEA nationals then they will be covered under reciprocal arrangements. If we are talking non-EU/EEA foreign nationals who are resident & working here then they will, as you say, be paying tax so they should be entitled to treatment. If foreign nationals are just here on holiday and use the NHS for non-emergency treatment they already get charged! So you’re left with what? The student population? It seems a totally daft, impractical idea. If that happened universities & colleges would just need to set up their own systems, they’re not going to have students wandering around with potentially infectious diseases going untreated. There are many situations where a socialist model is actually common sense. It doesn’t matter if your politics are left or right ordinarily if you are looking at a thing practically. This is one of those situations.